Why did I read this book: I was intrigued by the premise of this novel: in a future where old age is eliminated, how would humanity’s priorities change? What does it mean to have the potential to be young forever? And, on a shallow note, I love the cover. In the early 21st century, a redheaded geneticist, Dr. Graham Otto, tries to isolate the gene responsible for causing red hair. Instead of finding a way to alter one’s natural hair color, Otto inadvertently discovers the gene that controls aging – and the world will never be the same. Broadcasting and publishing the news of his discovery, the American and international public soon clamor for “the Cure” – and while initially prohibited and limited to black market dealings, soon Dr. Otto’s discovery becomes legal and increasingly widespread. With the world’s “luckiest” generation receiving the cure, humanity’s priorities begin to shift. Marriages dissolve and take on a new form entirely (when one can stay young forever, what’s the use in planning for retirement before death, or mapping out exactly when to have children?). And, while one can stay looking exactly the same and never aging a day beyond date of taking the cure, people are still very much mortal creatures that can die of sickness, accident, suicide, or murder. As the population increases with a minimal death rate, the world’s finite resources show the strain. Pro-natural/anti-cure fundamentalists emerge as dangerous individuals with a singular agenda to wipe out as many “postmortals” as possible. In the middle of this tumultuous new world order is John Farrell. A man who took the cure at 27, John navigates The Postmortal in a collection of his journal entries and articles, from the uncertain days before the legalization of the cure, to the ultimate solution to postmortals decades later. It is John’s narrative, loaded with (ok, somewhat predictable) ennui, that defines the novel. John, a lawyer that soon learns to specialize in “marriage cycles” since no one – especially no one with money – wants to be married FOREVER forever, coasts through life in reaction mode. While John isn’t a character that is remotely sympathetic or even very interesting, I loved many of the questions that The Postmortal raises through its iffy protagonist. Would eternal youth truly mean the end of love? The end of compassion? Would it reduce humanity to its basest instincts, with a perpetually young-looking crowd getting drunk all day and night, committed only to a hedonistic existence? Would it polarize people and countries so dramatically? 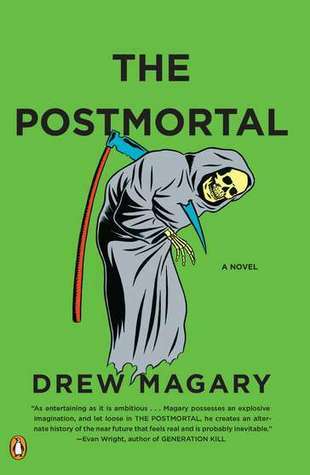 While this incarnation of society in a world without age is fascinating and Mr. Magary’s take on postmortal life is undeniably interesting…I don’t know if I buy it. Perhaps this is solely because the world is filtered through the apathetic (and utterly miserable) John Farrell’s world view. If one had an eternity to live and be young, would people take chances and do things they never could have done before? Or would they be so afraid of losing that youth and chance at eternity that they’d be content to drift through the same existence that characterized their “mortal” lives? I don’t know the answers to these questions, but I can’t help but feel that there should be more variety, more boldness to the humans in this postmortal world. Beyond the ideological arguments, The Postmortal is a grimly funny book and written solidly enough. From a writing perspective, I did enjoy the almost epistolary form that the novel took as narrated through the records of John Farrell, with first person entries as well as assorted clippings and news stories. The first two parts of the book are fascinating as the world undergoes drastic change with the acceptance of the cure, and I loved the tension between pro-life and pro-cure groups. Fundamentalism and “trolls” are believable obstacles to eternal youth, and I think are depicted wonderfully in the early parts of this book. And, though the protagonist of this piece leaves much to be desired (I’m sorry, but an abundance of male doubting and typical ennui doesn’t cut it for me), I did enjoy the psychological exercise that The Postmortal provides. If nothing else, it provokes these questions – even if you don’t agree with Mr. Magary’s relentlessly pessimistic world view with humanity portrayed as narcissistic in the extreme. Though the book drags in its final act and lacks any forward mobility (again, due to its pathetically apathetic hero), the concept behind the novel is strong enough to warrant a recommendation. Just be prepared for some very dour predilections regarding human nature. Notable Quotes/Parts: No excerpt, but you can check out the book trailer HERE. There is a short story in Ursula Le Guin’s Changing Planes (“The Island of the Immortals”) that takes place on a planet that has one immortal species and one mortal species — and the mortal species has to take care of the immortal one (because bodies do age and change). It really makes you rethink immortality! It sounds great, and the trailer just made it sound even better. If there’s one thing that I love, it’s a dystopian novel that raises questions about our own world.